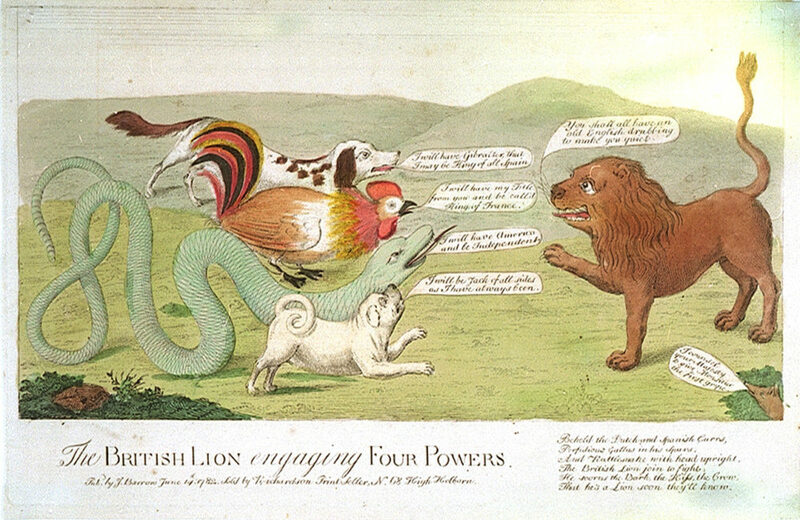 J. Barrow, “The British Lion engaging Four Powers,” 1782, via National Maritime Museum, Greenwich, London. Political cartoons provide insight into public opinion and the decisions made by politicians. Cartoons became an important medium for voicing criticism and dissent during the American Revolution. In this 1782 cartoon, the British lion faces a spaniel (Spain), a rooster (France), a rattlesnake (America), and a pug dog (Netherlands). Though the caption predicts Britain’s success, it illustrates that Britain faced challenges –and therefore drains on their military and treasury—from more than just the American rebels.